The Continuing Education Tracker offered by AAC Institute is intended to make it easier to record and track the Continuing Education credits earned by AAC Institute subscribers. 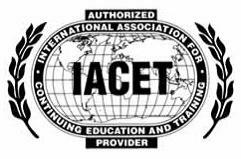 Continuing Education activities for which AAC Institute is offering CEUs are stored in the database, which doubles as a searchable directory of the activities occurring in the near future. After attending an activity, participants can sign in and indicate that they attended an activity, check which sessions were attended, and complete the evaluation and learning assessment forms all from any computer. Certificates of participation, complete with CEUs earned, can be downloaded and printed. Thus, records of Continuing Education over any time period can be accessed. No paperwork to deal with. This service is provided without cost. However, donations are welcome and support the continued development and offering of such services.